We help CEO's create profitable and productive workplaces based on a strong foundation of People, Process and Technology. We create companies where the best talent wants to work. It starts with an employee survey, followed by a day onsite to interview key personnel, meet with key managers and perform a walk through of the organization to gain insights for creating an innovative workplace where productivity, engagement and high performance is the cultural norm. Develop your leaders and managers to motivate your workforce, build trusted relationships and create a culture of people that want to give 110%. Increase employee productivity and retention. Reduce conflict and the natural adversarial relationships between management and employees that prevents things from getting done or causes good employees to leave. Through the use of a carefully selected and administered set of assessments, we help you understand what talent already exists in your organization and how to use this information as a strategic advantage. Get the right people in the right roles so you can leverage their strengths and improve employee performance, engagement, satisfaction and retention. According to MIT, 50% of the difference between low performing teams and high performing teams is the quality of their communication. In this day long team building session, we help teams embrace their differences and learn how to improve their communication based on their differences. Differences create diversity. Diversity strengthens teams and when leveraged diversity creates high performance. The traditional labor pool is shrinking. Rapidly changing technology requires new skills. Growing companies need a new tact for attracting and retaining talent. 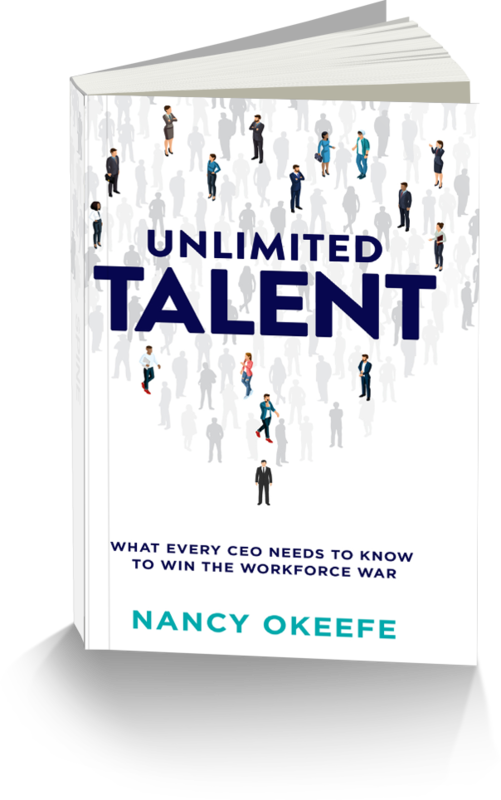 Nancy shares insights into how companies can find talent in a new way and improve the odds that employees will stay in their organizations longer. Differences create diversity. Honoring diversity strengthens teams and when leveraged with the right bias free mindset and communications, high performance blossoms. Nancy shares how you can change the conversations in your organization and positively impact productivity, employee engagement, employee satisfaction, retention and your results. Available on Amazon. Click Image To Purchase.